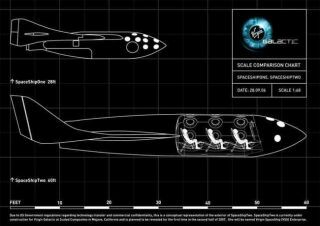 Work is now underway on building SpaceShipTwo ? a multi-passenger vehicle for suborbital space travel. Shown here is relative scale of new vehicle contrasted to the SpaceShipOne, also built by Scaled Composites of Mojave, California. Before you strap into any U.S.-operated private spaceship, you'll be told about the risk as well as rewards of flying the friendly space skies. The Federal Aviation Administration (FAA) issued on December 15 a set of rules for crew passengers - dubbed "Space Flight Participants" involved in private human space flight. The FAA rulemaking is crafted to protect the safety of the uninvolved public. They also call for measures that enable passengers -- before they buckle into spaceships -- to make informed decisions about their personal safety. "The regulations require launch vehicle operators to provide certain safety-related information and identify what an operator must do to conduct a licensed launch with a human on board," the FAA explained in a statement. In addition, launch operators must inform passengers of the risks of space travel generally and the risks of space travel in the operator's vehicle in particular. The newly released regulations also include training and general security requirements for space flight participants. The FAA regulations don't just deal with passengers, but also the pilots that welcome space travelers onboard their company spaceship. Spelled out are requirements for crew notification, medical qualifications and training. Provisions governing environmental control and life support systems onboard a spaceship are also noted. In addition, the regulations require a launch vehicle operator to verify the integrated performance of a vehicle's hardware and any software in an operational environment. The Office of Commercial Space Transportation (AST) within the FAA led the work in creating the private human space flight requirements for crew and space flight participants. Congress mandated the regulations in the Commercial Space Launch Amendments Act of 2004. Because public space travel is a fledgling industry, lawmakers called for a phased approach in regulating commercial human space flight - with regulatory standards evolving as the industry matures. "This new transportation challenge brings added responsibility for the public's well-being," said Mary Peters, U.S. Secretary of Transportation. "These new space travel rules are consistent with the department's long-standing commitment to public safety." "Private human space flight will be an unparalleled adventure," said FAA Administrator Marion Blakey. "In an environment where some level of risk will always be present, this action underscores the FAA's firm commitment to public safety." The Personal Spaceflight Federation (PSF) also noted the new rulemaking. It applauded the direction provided by the FAA's AST "in helping to build the foundations for personal spaceflight," said Alex Tai, Chairman of the PSF. Tai is also chief operating officer of Virgin Galactic - the public spaceliner group set up by British billionaire, Sir Richard Branson. The PSF is comprised of private, public and non-profit organizations working to make commercial human spaceflight a reality. PSF members include spaceship developers and operators, spaceports, space destinations, and space transportation agents. "The PSF welcomes the collaboration with industry that AST sought in creating these rules," Tai told SPACE.com.